Own Correspondent|Heads of States on Tuesday showed their never ending love for former Zimbabwean President Robert Mugabe after the former leader stole the show in the on-going conference. A video clip of Mugabe lashing out at Morocco over its imperialism in Western Sahara dominated the SADC leaders solidarity conference in Pretoria. 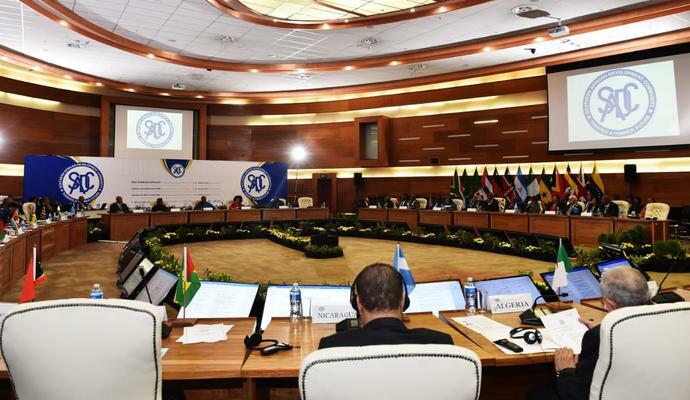 SADC is holding a solidarity conference as part of efforts to push for the independence of Western Sahara whose territory is currently occupied by Morocco. “A clip of Mugabe reacting angrily at Morocco’s admission into the African Union (AU) was played yesterday,” President Emmerson Mnangagwa’s spikesperson Charamba revealed. “There is nothing unusual about it. The Sahrawi Arab Democratic Republic (SADR) is regarded as the last colony on the continent, Zanu PF is a liberation movement and so is the Porisario Front. “There was indeed a slot for a video and it was played. His (Mugabe’s) ideas are held in high regard and they continue to influence us that’s why we have the land reform program,” Charamba said. As if this was not enough, Mugabe’s former Foreign Affairs Minister Simbarashe Mumbengegwi is also attending the conference as a “Special Guest” to the conference organisers, it was learnt. Mumbengegwi is Zanu PF secretary for external affairs and pictures showed him interacting with South African International Relations Minister Lindiwe Sisulu. At the time Morocco was re-admitted in January 2017, Zimbabwean officials attending an AU conference in Addis Ababa were clear Mugabe did not support the move. “If Morocco wants to be a member of the African Union, it has to accede to the principles of the African Union,” an official was quoted as having said. However, Morocco was admitted despite Mugabe’s protestations, amid reports the North Africa country had used its oil wealth to arm-twist African leaders to accept its return to the AU fold. The fall-out between Zimbabwe and Morocco spilled into Mugabe’s bid to have the Tourism Minister Walter Mzembi elected as United Nations World Tourism Authority (UNWTO) secretary general. Morocco which at the time was one of a few African countries who held a vote went against Zimbabwe and in the process influenced other countries such as Tunisia to do the same. “Then there was the Morocco factor. Morocco did not like Zimbabwe because Zimbabwe was opposed to its readmission to the African Union, until it frees Saharawi,” state media reported. Georgian Zurab Pololikashvili won the poll.